Each year, the Virginia Wineries Association hosts The Virginia Governor’s Cup wine competition. Over 40 world-class judges taste and rate over 400 Virginia wines (here’s the complete judging criteria). The twelve highest rated wines are awarded a place in the Governor’s Case. And the wine with the highest overall score is the Governor’s Cup winner. Here is the 2014 Virginia Governor’s Cup Governor’s Case, and, if you’re curious, here’s the complete list of the 2014 Governor’s Cup award winners (gold, silver and bronze medalists). 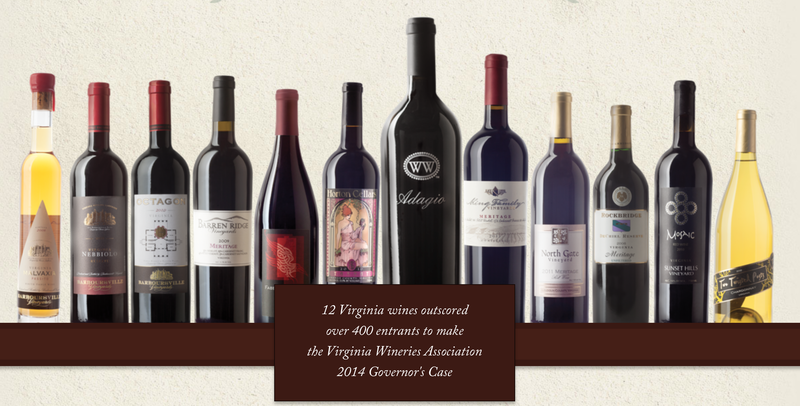 I always think the Governor’s Case looks naked without Virginia’s signature grape, Viognier. Why no Viognier? It all boils down to timing. The Virginia Governor’s Cup is held in late February. To enter a wine into the Governor’s Cup, a winery must have 50 cases of the wine available at that time (so consumers can get their hands on some of the winning wines). Want to guess what’s mostly sold out by February? Current vintages of Viognier. And guess what hasn’t been released in February? New vintages of Viognier. So, too often, Viognier is MIA from the Governor’s Case. For this month’s Carpe Vinum, we thought it would be fun to choose six wines from the Governor’s Case (now you get it) and have a taste. So, without further delay . . . here are the wines we tasted and the foods we paired them with. As always, the food titles link to recipes. Bon Appétit! Yes, I know this wine wasn’t in the Governor’s Case. But like I said, I think the Governor’s Case is naked without Viognier, so I added one. It’s my blog, and I’ll add if I want to. (King Family’s Meritage is in the Governor’s Case, and deservedly so — we tasted it at the winery a few months ago, and it’s an incredible wine). Year in and out, King Family is one of my favorite Virginia Viogniers. It never disappoints. Crisp and dry, not overly unctuous. Medium-weight. Super tropical with a loooooong finish. Delightful. $24. Manchego = 👎 In a word . . . gross. Queso Fresco = 👎 Way too light to stand up to Viognier. Not good. Vermont Cheddar = 👍 Finally . . . success! I’ve tasted a lot of Virginia red wines over the years, and quite honestly, I have a tenuous relationship with them. Most fall solidly into the meh category. But lately, I’ve been tasting a lot of Virginia red blends, and they’re slowly winning me over. Red blends may just be the future of red wine in Virginia. But I’d be remiss if I didn’t point out their common denominator . . . a lot of the red blend wines (the all of the ones we tasted here) are $45+. That’s expensive! A refrain Virginia winemakers and Virginia wine-lovers hear in perpetuity. But why is Virginia wine so expensive? Steven Ballard from Annefield Vineyards wrote an extremely thoughtful blog post about why Virginia wine is “so expensive”. Virginia wine is expensive “simply [because it] is more expensive to grow and make wine in Virginia.” I urge you to take a look at the post — some food for thought. A blend of 37.5% Merlot, 37.5% Cabernet Sauvignon, 18% Cabernet Franc and 7% Petit Verdot. Very nicely structured. I love the funk on this wine! It’s loaded with tar and tobacco flavors. Way more complex than I expected. Incredible black licorice finish. 14% ABV. $52. The textures in the dish worked so well together. This recipe is definitely going into permanent rotation! The wine developed some interesting white pepper notes with the mushrooms. The Tannat grape originated in the foothills of the Pyrennes Mountains in southwestern France, but today excels in Uruguay. Tannat flourishes in humid climates, so it no doubt feels right at home here in Virginia. Another blend . . . 75% Tannat, 19% Cabernet Sauvignon, and 5% Petit Verdot. The salesperson at Fabbioli explained that Tannat is pronounced similar to not, as in “Ta-NOT tonight”. Little things amuse me. Almost purple in the glass. Smoke, spice and leather notes. Decent balance. Really enjoyable. 13.9% ABV. $45. There are some crushed red pepper flakes in the bread pudding. I was a little concerned the wine might fight with the spice, but it was a very nice juxtaposition of flavors. The perception of acid in the wine definitely increases with the food. But I love how the smoke and spice of the wine compliment the earthiness of the broccoli and pancetta. There’s also a surprise cocoa note that develops with the food. Mmmm. Octagon 2009 won the Virginia Governor’s Cup last year, and deservedly so. Octagon is consistently one of Virginia’s best wines. Whenever I want to buy someone (well, someone I like) an impressive bottle of wine from Virginia, I buy Octagon. A proprietary blend of Merlot, Cabernet Franc, Cabernet Sauvignon and Petit Verdot. Fermented in stainless steel, aged in French oak. Somewhat aggressive by itself (not an uncommon observation for this wine). Gorgeous red fruits and a tobacco finish. Needs time and food to really show itself. $55. I’ve never been a fan of the Bleu Family of cheeses, so my girlfriend prepared my steak sans sauce . . . everyone else raved about the gorgonzola sauce, though. The steak significantly tamed the tannins in the wine, and I loved the peppery arugula with the Octagon. Absolutely lovely! Bonus: My girlfriend brought these delizioso goodies back from her trip to Rome — truffle paste with these adorable snail-shaped crackers. SOOOO good. And fantastic with the Octagon! This was the 2014 Virginia Gold Cup WINNER! Adagio comes from the Italian, ad agio, meaning “at ease”. It’s used in music to signify a slow tempo. Hands-down, this is the most expensive bottle of Virginia wine I have EVER purchased at $72! That’s a lot of money to spend on a bottle of wine, regardless of its origin. I admit, I cringed at the price, but I really, really wanted to try the Governor’s Cup winner, so I got out my credit card. Was it worth it? A blend of 42% Cabernet Franc, 30% Merlot, 28% Petit Verdot. Aged in French, American and Hungarian oak. Extremely well made. Loads of blueberry notes with a second wave of fig and date flavors. Finish is more to the black olive and eucalyptus. Smooth, soft tannins. If I had another bottle, I’d lay it down for another decade and see what happens. Excellent vino. I reached out to Williamsburg Winery on Twitter for pairing suggestions for Adagio, and they suggested lamb. I don’t love lamb. I keep trying, but it’s not my thing. But I decided to try once again with this lamb and eggplant ragu. It’s still not my thing — there’s a gaminess to it that I just don’t care for. The lamb lovers in our group really enjoyed the sauce, though. And it was a hit with the wine — that eucalyptus note in the wine was superb with the lamb. This is a home run! A blend of Moscato Ottonel and Vidal Blanc, made in the traditional Passito process — the grapes are air-dried for 4 months in a special drying house before they are pressed and fermented for 6 months. Rich and complex flavors — apricots, honey and almonds. Beautifully balanced, it reminds me of a Sherry. 12% residual sugar — sweet without being a cloying mess. Delightful. $32. We enjoyed the Malvaxia with some Italian butter cookies (the raspberry jam filled cookies killed it with the wine) and these adorable faux green olives that are actually white chocolate covered almonds from a local candy store in Culpeper, Virginia. And we revisited the cheeses and finally found a partner for the manchego. The queso fresco, I’m still working on. I hope you enjoyed this month’s Carpe Vinum wines and pairings. Next month: The Days of Wine & Veggies. It can be tough to find Virginia wines outside of the Mid-Atlantic region. I agree . . . it’s time for the spring/summer edition of Secret Wine Santa!! Wish I could tag Jeff here . . .
Secret Cinco de Mayo . . . BRILLIANT!! So glad you posted! I really have a thing about the Adagio – I totally agree that it’ll age well, too (I just love time at Williamsburg Winery). Oh, and that parmesan bread pudding you paired with Fabbioli’s Tannat looks amazing! I’m hoping to take a weekend and get down to Williamsburg sometime this summer . . . it’s been at least a decade since I last visited! Salud!! Wow, that’s a whole lot of yum in one post! Surprised by the popularity of Tannat? I think of it as a warmer climate grape but I guess VA does get quite warm. Or maybe I just have a lot more to learn about the grape, usually the case. Virginia is unbearably hot in the summer, and relentlessly HUMID . . . which I understand Tannat loves!! I always tell folks to skip VA/DC in the summer . . . but right NOW is perfect for a visit!! Salud!